It pays to prepare healthy snacks for kids for in between meals or after school snacks. To keep their energy levels up and to keep them from snacking on things that are full of fats, sugars and artificial flavourings and colourings. Homemade snacks are in your controll so you know how much of what ingredient you put in. Nuts, seeds, or dried fruits are a great source of slow burning energy and healthy fats; they are full of vitamins and minerals and are great healthy snack ideas for in between meals. When kids come home from school they are usually worn out and tired from a hard day’s learning. Therefore, to keep kids from flopping on the couch and watching television get them into the kitchen making healthy snack food. This will get them active and get there energy levels up that homework becomes a breeze. With higher energy levels at their disposal outdoor activities and after school activities will catch their interest. Getting children involved in the cooking and preparation of their meals can raise their creative level in the kitchen and result in broadening their taste buds, which in turn will make them more open to trying new foods. A point that becomes more and more important with a daily growing selection on junk food. It's not enough just to limit ads for foods that aren't healthy. Preparing food, knowing what goes in and why teaches a lot about nutritionally balanced meals. Cooking with fresh produce that grows locally and is in season, lets kids reconnect with the yearly cycle and how it influences life and menu. Get festive and make snack foods for special occasions during the year. Make spooky Halloween snacks that will go down a treat or impress the family and make awesome Christmas snacks. Prepare warm snacks for winter like soups and pizzas and cold snacks for summer like vegetable sticks and dips. Cooking for other kids on sleepovers or parties is never easy. Therefore, when throwing a party serve a wide selection of birthday party snacks for them to choose from. 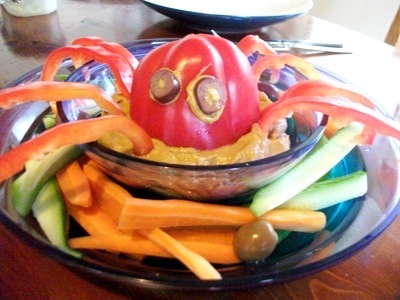 Do you have favourite recipes to prepare healthy snacks for kids? Share them!